“I was a catwalk model for many years and since I was 16 I was a landscape gardener on and off. I always did art, I decided to a City & Guilds Level 2 qualification in life drawing and painting, then I did an access course, which is like a foundation in Amersham College and then I did an Higher National Certificate qualification. 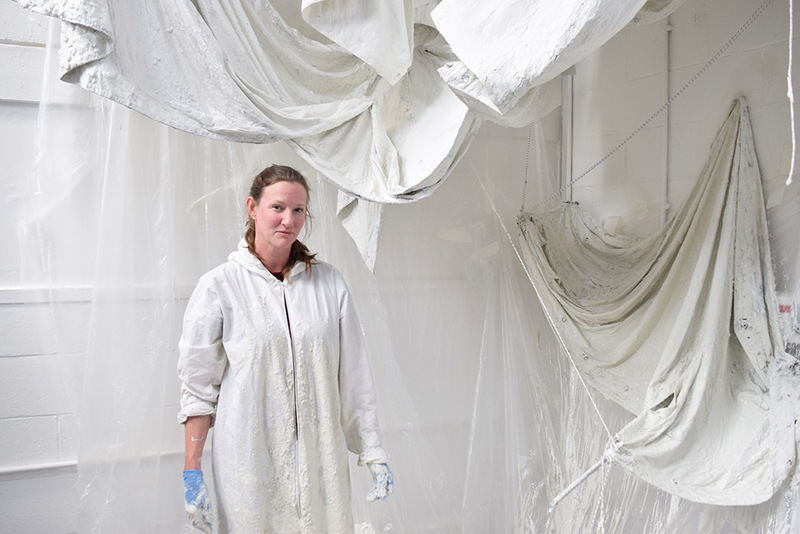 When I came to Wimbledon I actually started in Print and Time Based Media (PTBM) for a year, but I’m a builder so I left PTBM and transferred into Sculpture because it suited me more. My original application was at Chelsea, but I was called and told PTBM would suit me better. I came and looked at the Wimbledon campus and I really liked it, it was really intimate and it reminded me of the college I had come from. Most of my practice comes from people whose choices have been taken away from them by the hierarchy. I was homeless, kicked out when I was 13 and 15 years old, I’ve always struggled along. So it concerns me about people losing their homes, I’ve been going to speak to war veterans because 1 in 10 homeless people on the streets are war veterans. Lots of my work links back to war or soldiers. My best friend is a war photo journalist and I have been to a lot of areas with her – Yemen and Libya. The last trip was to the Syrian border of Jordan where we spent some time in the UNHCR (United National Refugee Agency) camp. The group of photographers were from Noor Photographic Society, I went in just using it to research for my own practice and to take measurements of the large wall that surrounds the camp. I took all the measurements so they could install all their photographs. My pieces are World War II German sniper tents which come in two parts: they are worn by soldiers when they are marching, coming together by buttoning up the middle, or they’re worn as ponchos, buttoning down the middle and also becoming a shelter. Each man carries half a tent, four poles and a piece of string. I was looking at the homeless sweepings in America, the police are there with their guns, they come along and all the belongings of the homeless get swept up by their version of the council and get chucked in the skip. It’s everywhere in America, so the image I am trying to show are all these tents being swept up into the corner. 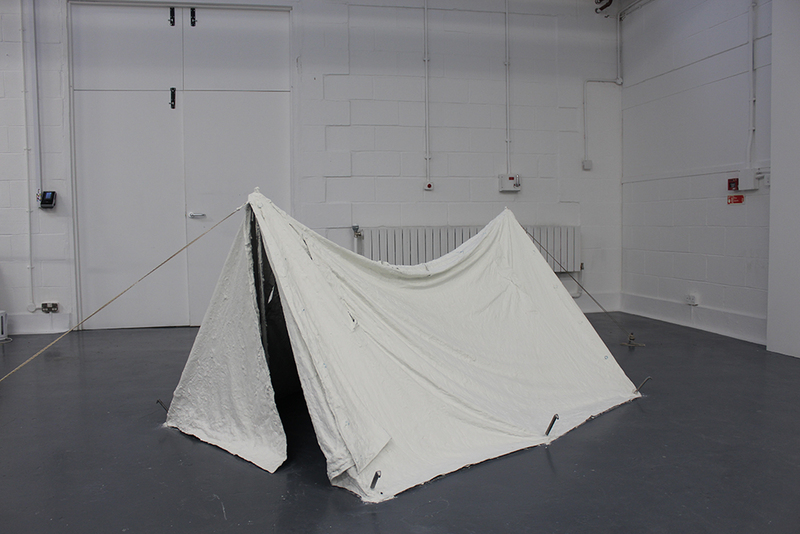 The first piece I made was a very pure and perfect tent, but then I wanted to break it up, force it into a corner, symbolising moving them along. What are you plans after you leave Wimbledon? I plan to go back into gardening/ landscaping. 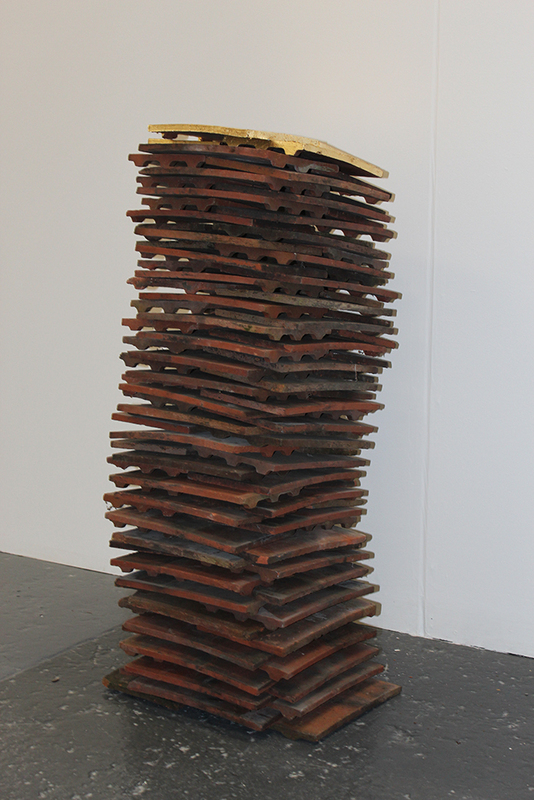 Having worked in sculpture and on this final piece, I plan to incorporate my sculptures into my gardening. I never thought they would meet, the gardening, landscaping and sculpture, but actually I think they would look really good in the garden and growing things through them. Especially a London garden that separates into different areas, my final piece for example would look quite light – rather than have a wall or something solid, this piece would bring more movement. It could be placed over a seating area to create shade. I do travel a lot and will probably go to India. Do you have a show must-see? Saber Ali who is also on my course, I really want to see what he does when he finishes. He has an architectural background, he mixes a little bit of politics. He is setting up really odd things, like a shower in the middle of a housing estate. At the moment he works a lot with collage, and his ideas are really big. I can’t wait to see it in the show. Is there a favourite project or piece of work that you completed while at Wimbledon? 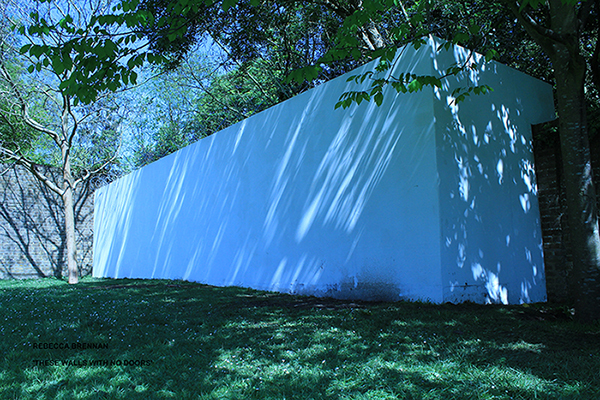 A site-specific project in Cannizaro Park for an annual event hosted by Wimbledon students called ‘Park 15’. It was during the Remembrance Sunday weekend and for me that was a really successful piece. Merton council really let me go for it so I was able to build this really huge piece with scaffolding and getting lots of people involved. There was an elderly veteran who would come and visit it every day, he said he loved it and it was really moving for him, which meant a lot to me. 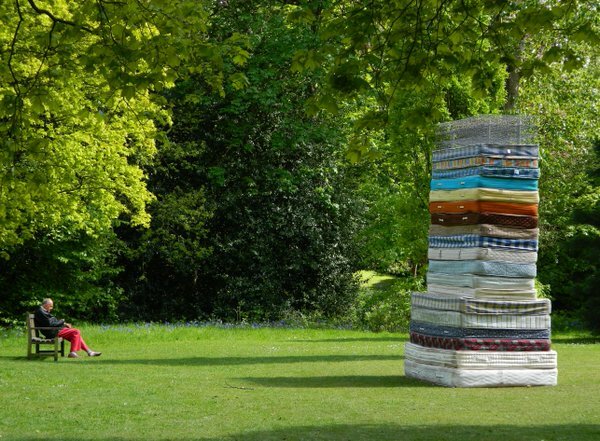 My piece looked like something quite attractive as you walk towards it, almost like something from ‘The Princess and the Pea’, it was very colourful, but then when you get up quite close to it, it smelled quite badly with all those filthy old mattresses that I reclaimed from a dump. It was a really involved build and I really enjoyed it – it’s a great testing ground to get your work out there. Finally, is there anything you would like to say about your work or your course? 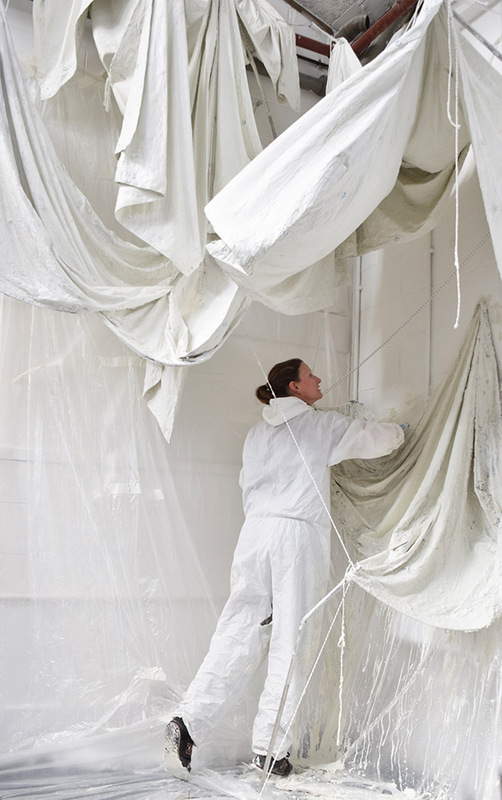 I think we are really lucky in the Sculpture course, it is a specialist pathway for fine art. To be with a small group of people who are really interested in building 3D objects has been a pleasure. I have been lucky because as a gardener I had a lot of technical skills, but if there was one skill I wish I did learn here at Wimbledon it would have been bronze casting. There are lots of opportunities to learn various technical skills so use them when you can. 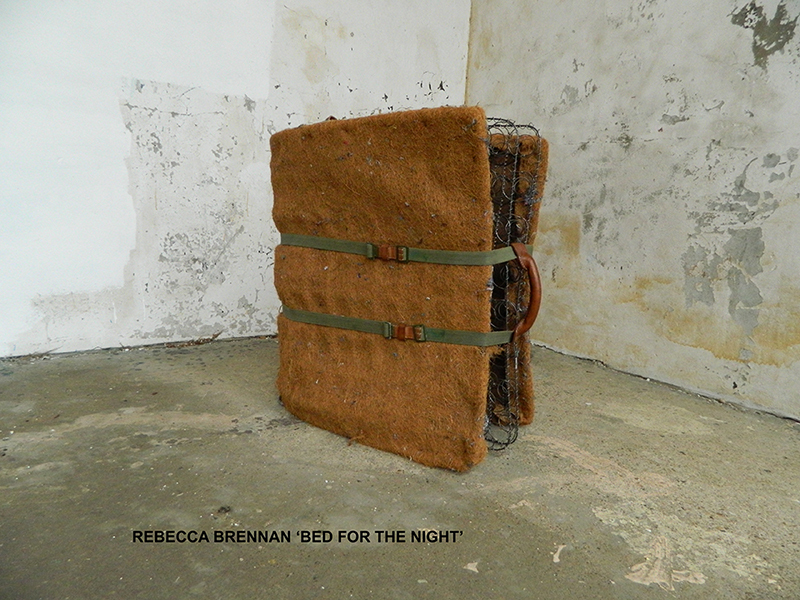 See Rebecca’s work at her Summer Show 2018 14-23 June (closed Sunday 17 June) and also on her Instagram.